The hand's joints are all fully posable with each individual finger and the thumb being able to move as well as make a fist. The functionality of the hand allows its user to do simple everyday tasks such as picking up items, eating using a knife and fork, typing and clicking a mouse or opening doors. It can even play rock-paper-scissors. But what also makes the prototype limb standout is its cost. 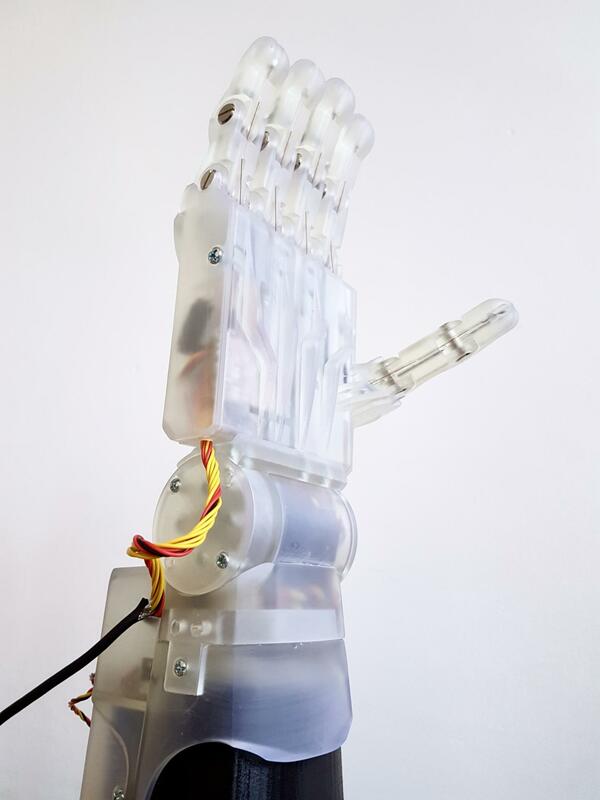 The students built the hand for just £307 and reckon they can make it even cheaper. In comparison an advanced robotic prosthetic limb can start at approximately £25,000, going up to £60,000 if bought privately. More affordable robotic hands with just basic multi-grip functionality still start at £3,000. So impressive is the design, it won 'best new development' in the Digital Innovation Challenge at the recent Industry 4.0 Summit and Factories of the Future Expo which was held at Manchester Central, in Manchester. Industry 4.0 is the term given to what some regard as the fourth industrial revolution. Connectivity is another key advantage of their design as it comes with blue tooth connection and an Android app for a smartphone. The hand is controlled by muscle sensors placed on the wearer's arm that can be paired to the app, which was also designed by the group. The University of Manchester, a member of the prestigious Russell Group, is the UK's largest single-site university with more than 40,000 students — including more than 10,000 from overseas.It is consistently ranked among the world's elite for graduate employability.